Caught up in the make-believe world of animation, the creativity and whimsy of the characters, and the early execution of the cartoon art all were factors in directing the professional path chosen by David Willardson. Willardsons' journey continued in the field of animation as he could create images that portrayed the essence of a story, Disney needed an artist that understood and was passionate about Disney characters. They needed an artist that could uphold the integrity of Disney's original drawings. They needed someone who could capture the personalities and emotions of the Disney family of characters. They needed David Willardson. 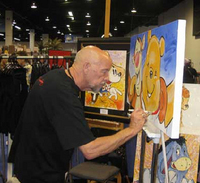 David Willardson was commissioned to paint the major movie posters for Disney Animation over a period of fifteen years. A small sample would include Bambi, Cinderella, Snow white, Little Mermaid, Aladdin, and The Lion King. While painting the characters in the traditional way, David Willardson also developed an energetic, colorful, stylized, dynamic, graphic painting style that not only captures the personality and emotions of the characters BUT captures their soul! Remember every time you purchase David Willardson artwork over $995, shipping is FREE in the continental U.S. and there is NO SALES TAX when you purchase outside of Colorado. 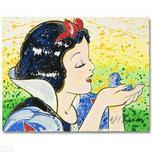 We SHIP WORLDWIDE and offer Layaway for David Willardson art.